Parkside District hasn’t been around long. I remember driving by it on the way too and from work earlier this year while it was still a construction zone. Then this happened and its opening was pushed back from the summer to the fall. I stopped in once to grab dinner to-go and was impressed by the menu and restaurant aesthetic. When I noticed that they were launching a brunch menu, I jumped at the opportunity to actually dine inside with my mom. What I ate: I struggled with what to order. 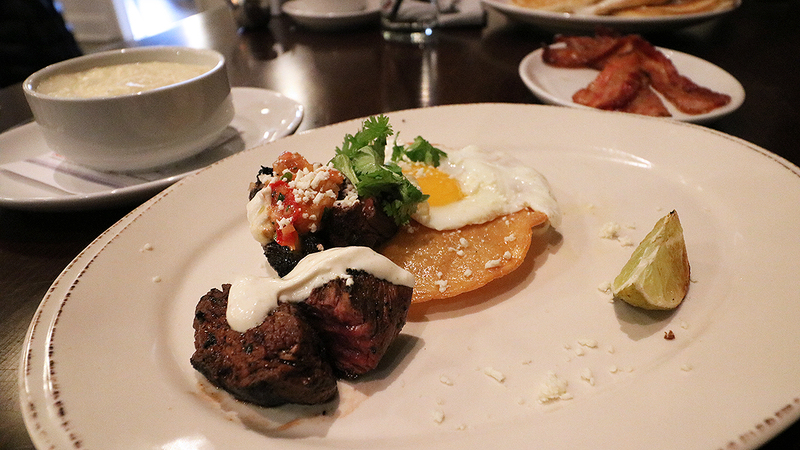 I wanted the Crab Cake Benedict but decided on the Steak Huevos Rancheros with an additional side of grits. My mom ordered White Chocolate Strawberry Pancakes with an additional side of bacon. When my meal came out, I was honestly surprised that it only took up half of the plate. But once I got past that, I found savory satisfaction in the crunchiness and the creaminess of the egg, lime crema, and tostada. I think I liked my mom’s pancakes more than she did. Perhaps they were too sweet for her. 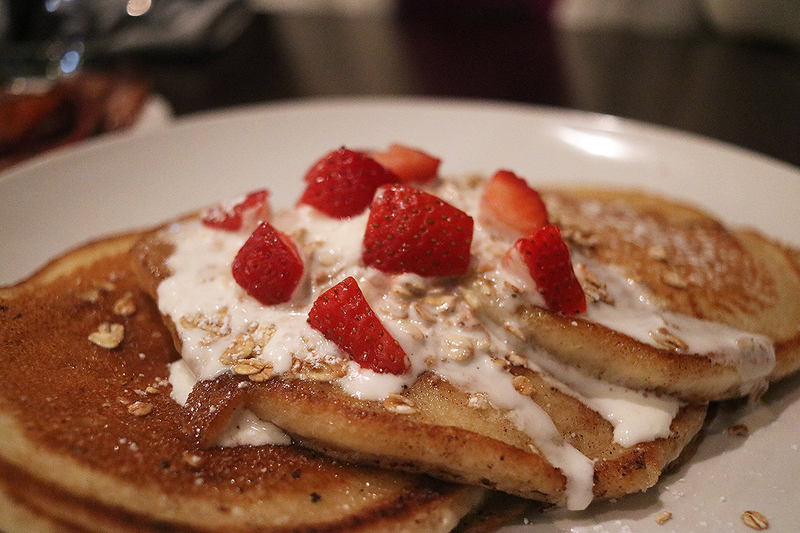 The buttermilk pancakes probably had a sweeter batter than say, IHOP’s but it wasn’t overwhelming. The drizzles and crumbles probably attributed to that flavor, too. 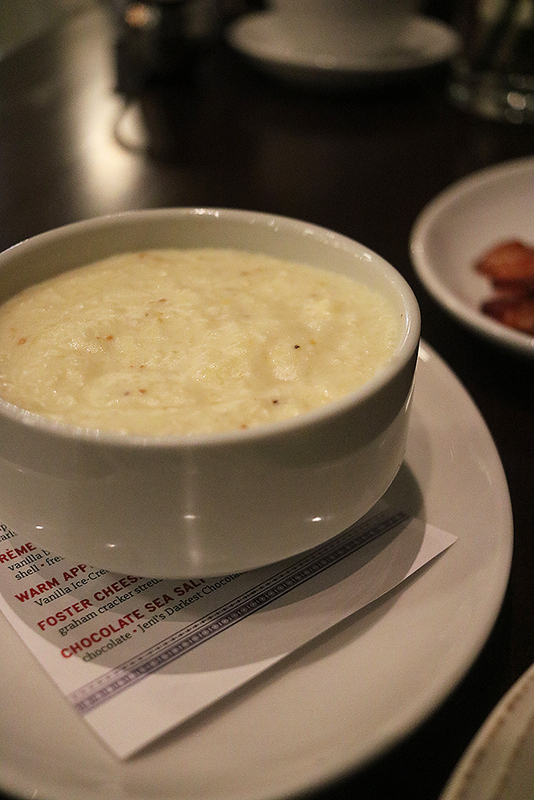 These grits were so creamy. I could eat several bowls. What I’d order the next time: Oh, I am definitely ordering the Crab Cake Benedict. What all can you order? The Parkside District brunch is succinct as there are only seven entrees and one is a customizable breakfast platter. You can also order Shrimp & Grits, Smothered Chicken Biscuit, and Banana Foster French Toast. Overall food price range: Brunch entrees range from $8.95 to $18.95. If you order a la carte, you can spend less than that. For the entire month of November, Parkside District is offering $2.95 bottomless mimosas in four flavors. What I’d drink next time: I usually just drink water with lemon so probably that. If another drink special was running, I might try one depending on the cocktail. What are other drinks you can order? They have sodas, teas, juices, and coffee. Depending on the month, they also offer drink promotions. And of course, there is a full bar you have access to as well. Overall drink price range: The drinks (excluding bar drinks) are less than $3 a glass. 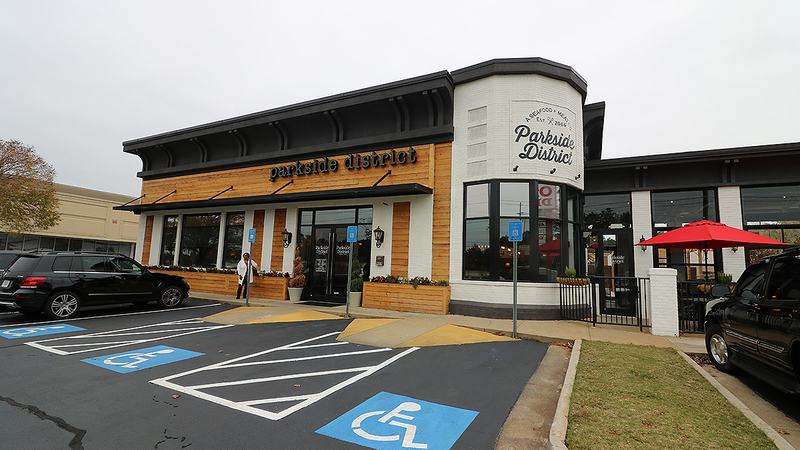 Describe the vibe: The exterior of Parkside District reminds me of a seafood spot overlooking the bay and an old meat-packing building, which makes sense because the restaurant prides itself on its seafood and meat cuisine. The interior is a mixture of a classy casual sit-down place in Atlanta and a suburban non-chain eatery. Our waiter was a really nice guy. He explained to us that this was the second week of their brunch (Nov. 12th) and they did not anticipate the crowd since the first week paled in comparison. We arrived at noon and it was pretty busy, but there were plenty of booths and tables available. Because the restaurant is still a bit new, there are a few typical growing pains but nothing worth storming out or demanding a refund. They’re still learning and getting the hang of things. Does the restaurant have any outdoor seating? I can’t wait to come back next spring when the weather is better but Parkside District has this really nice indoor/outdoor patio. With retractable, garage door-like windows, the patio can either be accessible all year long. But for those that prefer a more traditional patio setting, they have that too. Area: Parkside District is located off Duluth Highway across the street from a Mr. Clean Car Wash and in the shopping plaza next to Papi’s Cuban Grill and Publix. Brunch time: Brunch is only on Sundays between the hours of 11:00 am and 4:00 pm. 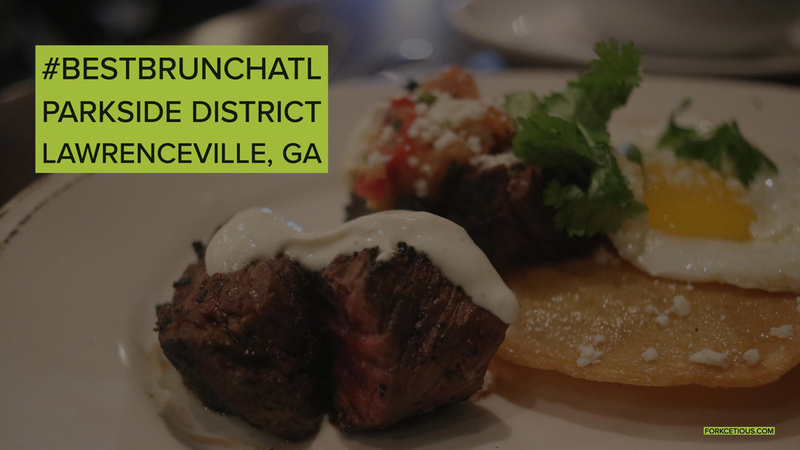 So, how was brunch at Parkside District? Brunch at Parkside District started out a bit rocky but improved over time. My grits made up for my small portion. Grabbing a few bites of my mom’s pancakes helped, too. 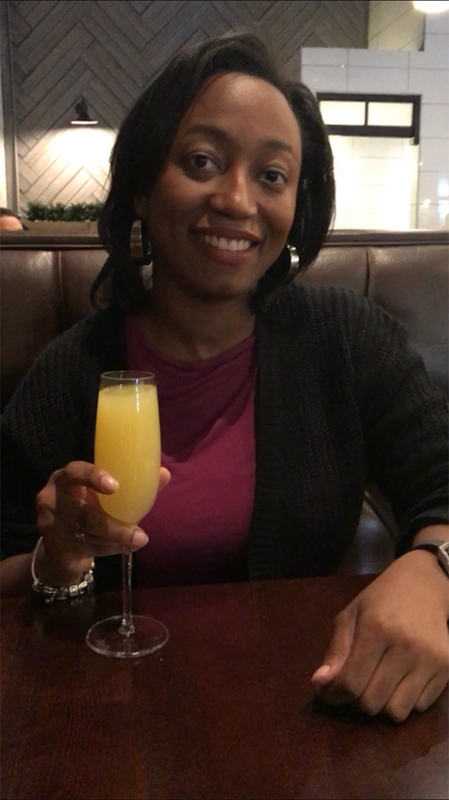 A polite waiter and a great mimosa promo sealed the deal. © 2017 Forkcetious. All rights reserved.